FAYETTEVILLE, Ark. 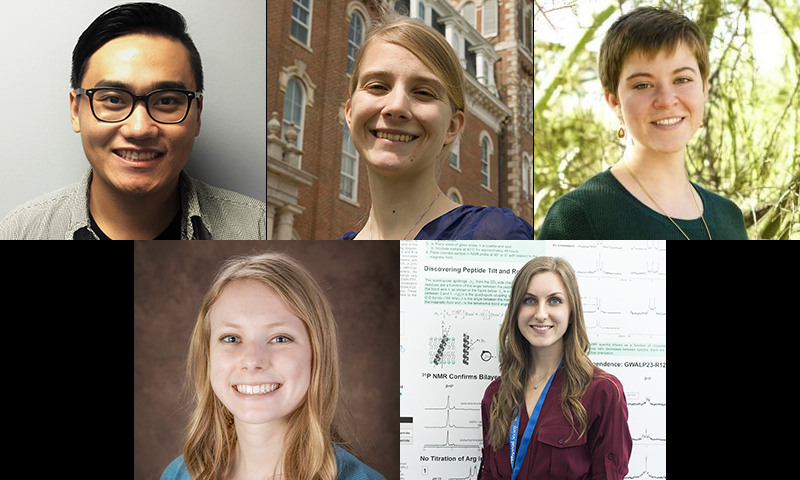 – Three University of Arkansas undergraduate students and three recent graduates have received National Science Foundation Graduate Research Fellowships for the upcoming academic year. The highly competitive awards are made to students in science, technology, engineering and mathematics and recognize academic excellence and the potential contribution that they will make to their field and to society at large. The sixth student, a recent graduate, has asked not to be named at this time. Each fellowship is worth $34,000 per year and can be renewed for up to three years. Along with the renewable stipend, each student’s institution will receive $12,000 per year to offset tuition costs, bringing the total amount of funding awarded in these six fellowships to more than $800,000. In addition to the Fellows, seven more U of A students received honorable mentions: undergraduates Christian Goodnow, David Jacobson and Christopher Matthews; current U of A graduate students Haley Brown, Hillary Fischer and Ashly Romero; and recent U of A graduate Michaela Mertz. Alex Khang graduated in 2016 with an honors degree in biomedical engineering from the College of Engineering. While an undergraduate, he researched Janus-type, polymer-protein nanofibers under the direction of Kartik Balachandran, assistant professor of biomedical engineering. Khang is currently pursuing a doctorate in biomedical engineering at the University of Texas at Austin. Larissa Markwardt is a senior honors physics major in the J. William Fulbright College of Arts and Sciences. Her undergraduate research mentor is Bret Lehmer, assistant professor of physics. Markwardt’s undergraduate research focuses on X-ray binaries in nearby, face-on, spiral galaxies. Kelly McKenzie is a senior honors electrical engineering and physics double major in the College of Engineering and Fulbright College. Her undergraduate research mentor is Morgan Ware, assistant professor of electrical engineering. In her research, she studies indium gallium nitride intermediate-band solar cells. Madeline Meier is a senior honors chemistry major in Fulbright College. In her current research under David Paul, associate professor of chemistry, she studies biosensors. Their work resulted in a recent publication in the Journal of the Electrochemical Society, with Meier as a second author. She was also recently named a finalist for the National Institutes of Health Oxford-Cambridge Fellowship. Jordana Thibado graduated in 2016 with an honors degree in chemistry from Fulbright College. Under the guidance of her mentor Roger Koeppe, distinguished professor of chemistry and biochemistry, she published a paper based on her undergraduate research in biochemistry as first author. She is currently pursuing a doctorate in physiology, biophysics, and systems biology at Weill Medical College of Cornell University in New York City. Since 1952, the National Science Foundation has awarded the highly competitive Graduate Research Fellowship to around 50,000 students in the STEM fields. The graduate fellowship program is one of the NSF’s oldest and most highly competitive, with roots in the foundation’s original 1950 charter. Each year, approximately 2,000 applicants are selected through a rigorous NSF peer-review process. Each grant supports graduate study that leads to a research-based master’s or doctoral degree. NSF Graduate Research Fellows are promising young mathematicians, scientists and engineers who are expected to pursue lifelong careers marked by significant contributions to research, teaching and industrial applications in science, mathematics and engineering. This group of fellowship recipients raises the total number of awardees from the U of A to 128. U of A students and recent alumni interested in applying for scholarships and fellowships such as the NSF Graduate Research Fellowship should contact the Office of Nationally Competitive Awards at awards@uark.edu or 479-575-3771. More information is available at awards.uark.edu. About the University of Arkansas: The U of A provides an internationally competitive education for undergraduate and graduate students in more than 200 academic programs. The university contributes new knowledge, economic development, basic and applied research, and creative activity while also providing service to academic and professional disciplines. The Carnegie Foundation classifies the U of A among only 2 percent of universities in America that have the highest level of research activity. U.S. News & World Report ranks the U of A among its top American public research universities. Founded in 1871, the U of A comprises 10 colleges and schools and maintains a low student-to-faculty ratio that promotes personal attention and close mentoring.